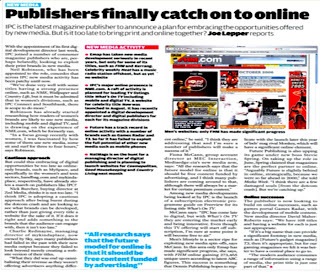 IPC is the latest magazine publisher to announce a plan for embracing the opportunities offered by new media. But is it too late to bring print and online together? With the appointment of its first digital development director last week, IPC joined a number of consumer magazine publishers who are, perhaps belatedly, looking to exploit their print brands in new media. Neil Robinson, who has been appointed to the role, concedes that across IPC new media activity has been patchy until now. "We've done very well with some titles having a strong presence online, such as NME, Wallpaper and Country Life, but it must be admitted that in women's divisions, such as IPC Connect and Southbank, there is scope to do more." Robinson has already started researching how readers of women's brands are likely to use new media, including mobile and digital TV, and is drawing on the experience of NME.com, which he formerly ran. "In a focus group recently with women, I was fascinated by how some of them use new media, some sit and surf for three to four hours," says Robinson. But could this embracing of digital opportunities be too late as online-only brands, such as MySpace, and specifically in the women's and teen sectors, handbag.com and mykindaplace, respectively, have already stolen a march on publishers like IPC? Nick Burcher, buying director at Zed Media, thinks it is not too late. "I think IPC is adopting a cautious approach after being burnt during the dotcom crash and are looking to see what brands can be developed, rather than just giving every title a website for the sake of it. If it does it right and adds something to the brands that the audience can engage with, then it isn't too late."